Acne is the term for plugged pores (blackheads and whiteheads), pimples, and even deeper lumps (cysts or nodules) that occur on the face, neck, chest, back, shoulders and even the upper arms. Acne affects most teenagers to some extent. During adolescence, rising hormone levels are thought to increase the number of oil glands and the amount of sebum they produce. The increased production of sebum causes blockage of hair follicles, leading to the formation of small bacteria-filled cysts. However, the disease is not restricted to any age group; adults in their 20s – even into their 40s – can get acne. While not a life threatening condition, acne can be upsetting and disfiguring. When severe, acne can lead to serious and permanent scarring. Even less severe cases can lead to scarring. Everyone’s skin is so different, we need to keep that in mind when effectively treating acne breakouts at home. Treating ache requires a multi-disciplinary approach. The home remedies for acne described below can be used in combination to provide the best results. Getting rid of stubborn pimples, blackheads and whiteheads starts with thorough but gentle cleansing of the skin. 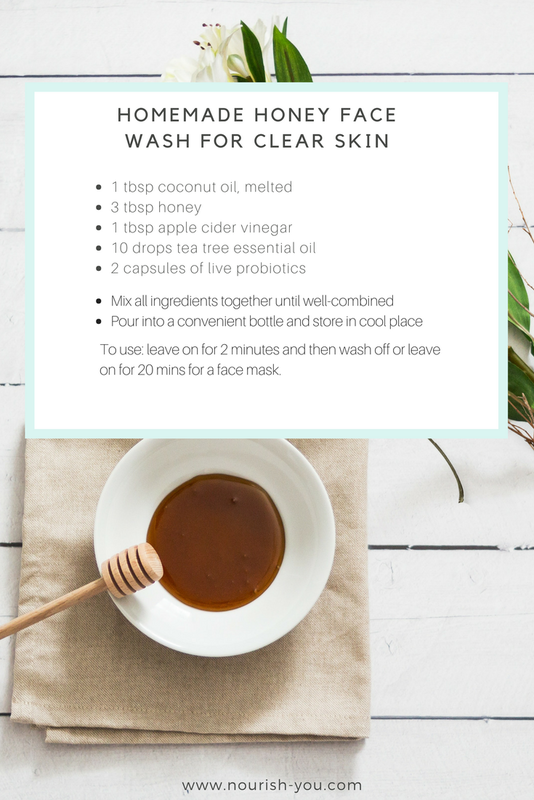 Try my recipe for Homemade Honey Face Wash to cleanse skin without causing irritation. It features apple cider vinegar, honey, coconut oil, probiotics and essential oils (like tea tree oil). The honey soothes the skin, the coconut oil helps to fight bacteria and fungus, and the tea tree oil helps to invigorate the skin. Dampen skin with warm water, and massage into face and neck. Rinse well and pat dry. Do this each morning and evening and, if needed, after workouts. Refrain from cleansing more often, as this can irritate the skin and cause an overproduction of oil. If you find that acne appears around your hairline, commercial hair products may be to blame. Shampoo, conditioner, hair spray, gels and mousses contain acne-causing ingredients, including petroleum, parabens, silicone, sulfates, panthenol and other chemicals. Like hair products, makeup and skin care products contain ingredients that can cause acne. Common offenders include lanolin, mineral oil, aluminum, retinyl acetate, alcohol, oxybenzone, triclosan, parabens, polyethylene, BHA and BHT, and formaldehyde-based preservatives. Read ingredient labels to avoid putting these types of chemicals on your sensitive skin. Switch over to a organic and natural brand, my favourites are The Organic Skin Co. and the World organic range. CALMING CALENDULA CREAM: "To combat breakouts on my skin, I recently tried something new. I mixed 2 drops of the Rose Attar Face Oil with the Calendula Cream and the Evening Primrose Cream. Within a week it proved a miracle all together for my breakouts! Try and you will see results after just one night! I can’t stop “Wow!”. It is amazing." - Julie R.
REPLENISH ROSE ATTAR ELIXIR FACE OIL: "The Rose Attar Elixir is great for scarring and pigmentation too. It has been an absolute legend product on my skin." - Donna W.
Toning is an important step in proper skin care. It helps to remove any residue after cleansing and helps to restore the skin’s natural pH levels. You can use pure apple cider vinegar (with the mother culture) as your evening and morning toner. Apple cider vinegar is packed with potassium, magnesium, acetic acid and various enzymes that kill bacteria on the skin. Chronic acne can be the result of bacteria and fungi that continue to spread and grow on the surface of the skin. With a cotton ball, smooth ACV over skin paying particular attention to active breakouts and acne prone areas. To hydrate and heal your skin, try applying masks a couple of times per week. Yogurt, honey, cinnamon, essential oils and other ingredients can be used to create soothing masks that help to hydrate skin and fight common causes of acne. Add a couple of drops of tea tree oil to either of the masks above during an active acne breakout. Tea tree oil is considered one of the best home remedies for acne. Clogged pores and dead skin both contribute to acne. (1) It’s important to exfoliate properly to remove build up, however keep in mind that commercially available scrubs are ridden with chemicals that can further irritate skin. Acne responds well to melalecua, more commonly known as tea tree oil. It’s used the world over as an antiseptic and to treat wounds. Like coconut oil, honey and cultured milk products, it fights bacteria and fungi. According to medical research, tea tree oil gels containing 5 percent tea tree oil may be as effective as medications containing 5 percent benzoyl peroxide. (2) Researchers do indicate that tea tree oil may work more slowly for some individuals, so try to be patient. To make a simple home remedy for acne using tea tree oil mix 4–8 drops of tea tree oil and one teaspoon of coconut oil or jojoba oil. Dab lightly onto the problem areas. Slight tingling is normal, but if the application causes lots of burning then discontinue use. Always use a carrier oil, as tea tree oil can be too harsh when applied directly to skin. In this study, sweet basil oil slightly outperformed holy basil oil in topical applications. Holy basil oil tea, or Tulsi tea, supports healthy blood sugar and hormone levels. As these two conditions are linked with acne, consuming herbal tea daily will help to balance hormones naturally, fighting acne from the inside out, making this one of the best cross-over home remedies for acne. Additionally, Holy basil tea can be applied topically to the skin as a toner. Either sweet basil or holy basil essential oils can also be added to homemade masks, cleansers or exfoliating. Contrary to popular belief, acne-prone skin still needs to be moisturized. Using topicals that focus on drying out the skin tricks the skin into producing even more oil, thereby further contributing to clogged pores and more acne. What is the best product for acne if you have dry skin? Coconut oil is one of the most versatile and healthy oils on earth. While it can be too heavy for some skin, coconut oil is an excellent moisturizer. A study published in Biomaterials found that lauric acid found in coconut oil demonstrates the strongest bacterial activity against acne caused by bacteria. (4) There is an increasing demand for coconut oil beauty products because the lauric acid, antioxidants and medium-chain fatty acids hydrate and restore skin and hair. is also used in traditional medicine topically for acne, particularly stubborn acne with inflammation. It is a vulnerary, non-tannin astringent and anti-inflammatory. For acne-prone skin during breakouts, it’s important to protect against sun exposure. Ultraviolet rays stimulate pigment producing cells, increasing the risk of acne scarring. (5) The best option is to use natural sunscreens and to only get an appropriate amount of direct sun exposure daily (about 15-20 minutes most days). Commercial sunscreens are packed with harmful chemicals that can irritate sensitive skin and acne-prone skin. Research shows that coconut oil has an SPF value of 8, as does olive oil. (6) To use as sun protection, apply a moderate amount to exposed skin every couple of hours and try to avoid spending too much time in direct sunlight during “peak” hours, which is about from 10am-3pm each day. Remember, fighting acne requires both external treatment and an internal treatment. Live probiotics support healthy digestion and immune system functioning, plus improves skin health by fighting acne. According to a recent study published in Dermatology Online Journal, researchers indicate that probiotic foods and supplements are a promising and safe acne treatment. (7) The study indicates that larger trials are still needed, but evidence thus far is promising for using probiotics to improve gut health and fight acne. As part of the protocol to treat acne from the inside out, it’s important eat foods that don’t cause blood sugar spikes or increased inflammation. There’s evidence that eating a low glycemic diet, meaning one that doesn’t include lots of processed grains/flour products and added sugar, can help prevent acne. Glycemic index measures how quickly foods raise blood sugar. Processed and refined foods, like those common in the Western diet, are high-glycemic, while meats and whole plant foods are low on the glycemic scale. Glycemic load is a measure of glycemic index times carbohydrates minus fiber. Most of the time, refined and processed food will have a high glycemic index AND high glycemic load, while certain vegetables will have a higher glycemic index, but very low glycemic load on the body. Focus on eating lots of leafy green vegetables, berries and clean protein. Increase consumption of wild fish, grass-fed meat and cage-free chickens. Healthy fats are essential to good skin health and treating acne breakouts at home, so include foods rich in omega-3s like wild-caught salmon. Add zinc-rich foods such as kefir, yogurt, lamb, pumpkin seeds and chicken. According to a recent study published in BioMed Research International, there is a correlation between low zinc levels and the severity of acne. Eat more high fiber foods since fiber found in vegetables, fruits, nuts and seeds supports cleansing the colon and growth of good bacteria in the gut. Add vitamin A rich foods to your diet, including spinach, carrots and beef liver. Foods to avoid for acne-free skin include hydrogenated oils, gluten, wheat, sugar and conventional cow’s milk dairy products. Researchers have found that conventional milk products can contribute to acne. (10) In addition to conventional dairy, it’s important to exclude known allergens or foods you have a sensitivity to — common food allergens include gluten, tree nuts, soy, peanuts and shellfish. Sugar and carbohydrate rich foods – Consuming excess amounts of sugar and grain products can feed yeast and candida in the body increasing acne. Gluten and wheat – These foods cause inflammation of the gut which affects the skin. Chocolate – Is high in compounds that can trigger acne. Eliminate chocolate completely if possible but if you consume it then make sure it’s pure dark chocolate. Fried and fast foods – These foods contain a number of ingredients that cause inflammation including hydrogenated oils, sodium, chemicals, flavorings and sugar. Hydrogenated oils – Causes oily skin and are one of the main causes of acne. Hydrogenated oils can be found in foods like pizza and in packaged foods that contain soybean oil, corn oil, canola oil, and vegetable oil. If you’ve ever suffered from acne in the past, then you’re probably wondering how to get rid of acne scars that can remain for months or even years. Treating acne scars takes patience and perseverance. The sooner you start treating a scar, the better possible results. The vast majority of individuals that get acne will experience some degree of scarring. The most important thing you can do to prevent scarring? During a breakout, never pick or pop pimples, whiteheads or blackheads! For 6 –12 months after an acne breakout, stay out of the sun as much as possible to avoid making dark spots and scars worse. When you are in the sun, use an all-natural sunscreen to protect skin. If scars do develop, dot a drop of rosehip seed oil, carrot seed oil or Rose Attar Elixir Oil on the scars twice per day until you notice a difference in the scar. Coconut oil, lavender essential oil, honey and gentle exfoliation can also help prevent scars, depending on your skin tone and texture. To naturally heal acne scars you can make a paste of raw honey, lavender essential oil, tea tree oil and frankincense oil. Combine all ingredients into a jar. Mix well. Apply daily, leaving on the skin for 10–15 minutes. Wash thoroughly. Acne will sometimes go away on its own with time, especially if you get acne as a teenager or during a stressful period of your life. But if you’re suffering from ongoing cystic acne then it’s best to visit a doctor for help, since this usually points to a bigger problem. Big, inflamed, painful cysts under your skin indicate that an underlying health problem may be to blame, such as PCOS, a thyroid problem, etc. Talk to your doctor about potential causes and ways to treat acne holistically depending on your unique situation. Acne (acne vulgaris) describes several different types of skin conditions that cause acne symptoms like whiteheads, blackheads, papules, pustules, cysts and discoloration or scars. Some of the top home remedies for acne and acne scars are gently cleansing skin, toning, moisturizing, balancing hormones, protecting skin from sun damage, using essential oils and eating a healthy diet. After you have gotten rid of acne, it’s important to stick with a healthy diet, drink plenty of water, keep up with your new skin care routine and change your pillowcase every week to prevent breakouts from returning. We all want skin that has a healthy, youthful glow. But it can be difficult to attain, unless you are clear about how you look after yourself and your skin. Here are 10 steps you might want to implement not only to promote great looking skin, but to improve your general health as well. 1. Buy Certified Organic Products that are certified organic will almost certainly be free of dangerous synthetic chemicals. Instead, they will be packed with therapeutic, natural ingredients. Look out for cosmetics and personal care products that are certified by one of these respected agencies – BioGro, NSF, USDA Organic, NaTrue, Eco-Cert, ACO (Australian Certified Organic), NASAA Australia, Soil Association UK. 2. Check The Ingredients List Always check the ingredients list if you can. A lack of regulation in the industry means that many products claim to be natural and organic when they aren’t. If the product has less than 95% natural ingredients or contains ingredients which you can’t pronounce without a chemical engineering degree, then you probably want to avoid it! 3. Stop Treating The Sun As Your Enemy The sun is not our enemy. In small doses, it actually does us good, offering us Vitamin D and a happier frame of mind. What’s more, most of the sun blocks we use contain dangerous petrochemicals like oxybenzone. If you go out into the sun for a prolonged period, cover your skin with light clothing and a hat, and try to use natural sunscreen formulas with non-nano zinc or titanium. 4. Drink Water We are exposed to hundreds of environmental toxins every day. Drinking filtered or spring sourced water is the best way to flush these toxins from our system. 5. Sleep, Relax, Be Happy A good night’s sleep is vital to maintaining our immune system and keeping us looking and feeling young. Taking time out to relax has a similar effect, as does a positive state of mind. Happy thoughts and a positive approach to life benefits both your emotions and the way your face settles into its evolving, natural shape as we age. 6. Avoid Excess Our skin is a mirror for the way we treat ourselves. Try to avoid an excess of alcohol, too much junk food, continuous late nights, and even over-complicating your skincare regime. And if you smoke, do your best to give it up altogether. 7. Exercise Regularly Exercise is an essential component in maintaining a healthy skin. It increases blood flow and thus helps nourish skin cells and keep them vital. 8. Deal With Stress Unfortunately, stress is a prevalent condition in our daily lives. It has a major impact on our general well being and the health of our skin. Regular exercise, meditation and a positive outlook are all effective techniques in helping us to deal with stress. 9. Eat Well A good diet is not only necessary to keep us healthy on the inside, but also looking good on the outside. A diet rich in healthy oils from foods such as walnuts, seeds and fish, and high in antioxidants found in foods like whole fruits, berries and vegetables is an essential component in maintaining a youthful, vibrant skin tone. 10. Think Green Look out for products that are earth-friendly, recyclable, and free from testing on animals. They will prove a boon not only for your skin, but also your peace of mind.